The Wings & Wildlife Art Show is the The National Aviary’s annual juried show highlighting Wildlife Artists from across the region. We are happy to announce our first ever participation in this show as one of the 18 Makers selected for the National Aviary Maker Challenge, a collaborative effort with Bridgeway Capital’s Craft Business Accelerator and MONMADE. 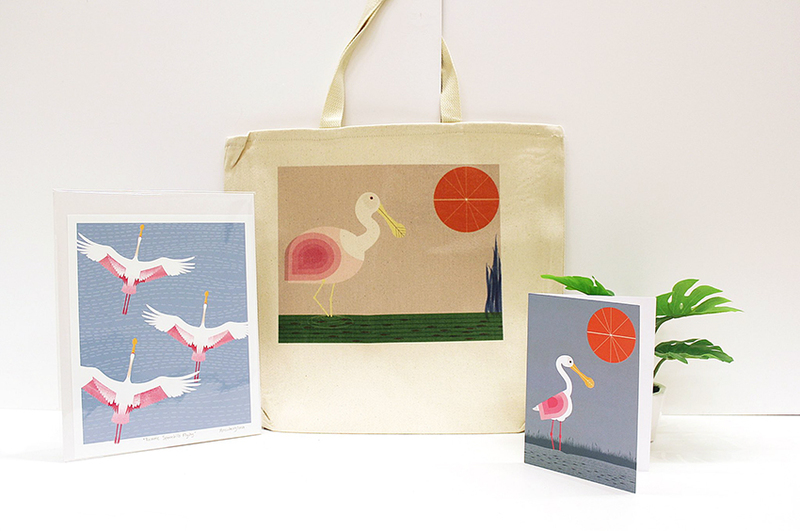 Some of the products, such a prints, tea towels, greeting cards and tote bags that we designed exclusively for The National Aviary as a part of The Maker Challenge are below! Approximately 40 artists will be selected to include their work in the show in November and will be set up throughout the lovely National Aviary’s spaces. The National Aviary’s call to be a part of Wings & Wildlife Art Show is open until April 30, 2018 and if you are interested in participating you can apply here. For more info check out this article in the Pittsburgh Tribune Review about the 2018 Wings & Wildlife Show or visit The National Aviary’s Wings & Wildlife Call for Artists Here. The National Aviary is America’s only independent indoor nonprofit zoo dedicated exclusively to birds. Located in right here in Pittsburgh, on the historic North Side, The National Aviary’s diverse collection comprises more than 500 birds representing more than 150 species from around the world, many of them threatened or endangered in the wild. On July 1, 2017 The Aviary announced The Maker Challenge, a partnership with the Monmade, which is trade group for creative, maker-based entrepreneurs that we are a part of here in Pittsburgh and we were honored to be among the 18 chosen local makers for The Maker Challenge. The Maker Challenge features one local craft business, maker enterprise, or entrepreneurial artist each month who have been hand selected to create new and exclusive products for their gift shop. Each Maker was assigned a particular bird and month in the Aviary to highlight the conservation struggles and efforts worldwide for that particular species. Our month is March 2018 and our special bird is The Roseate Spoonbill, a wading bird of the ibis family with distinctive white, buff-yellowand pink feathers. 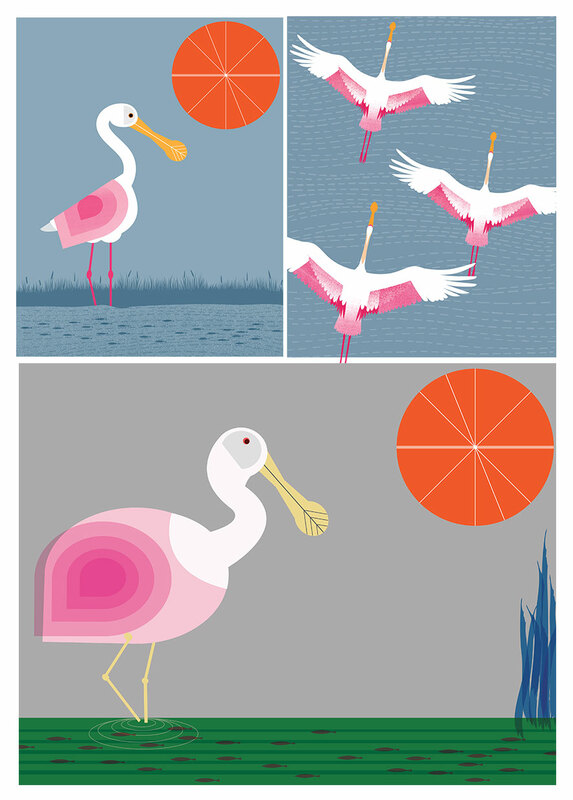 Once common, the Roseate Spoonbill was avidly hunted for its plumagein the US to near-extinction in Mid-to-Late 1800s. Now returning and found in the coastal Gulf regions of the Southern US, as well as in the Caribbean, Central and South America. 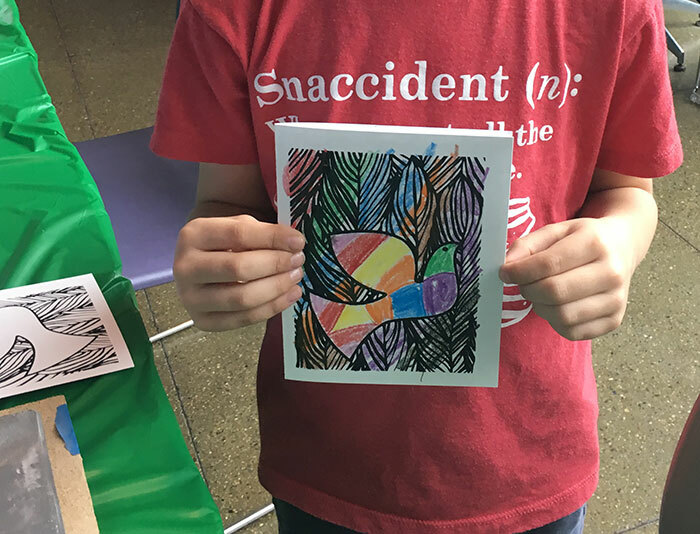 Shown here (and the last photo below) are some of the illustrations and designs that we created exclusively for The National Aviary to carry in their gift shop, and available there through the summer of 2019. Our suite of products include prints of all 3 of the above illustrations in 2 standard sizes (8×10 and 114×14 inches), as well as greeting cards, tea towels and canvas tote bags too. 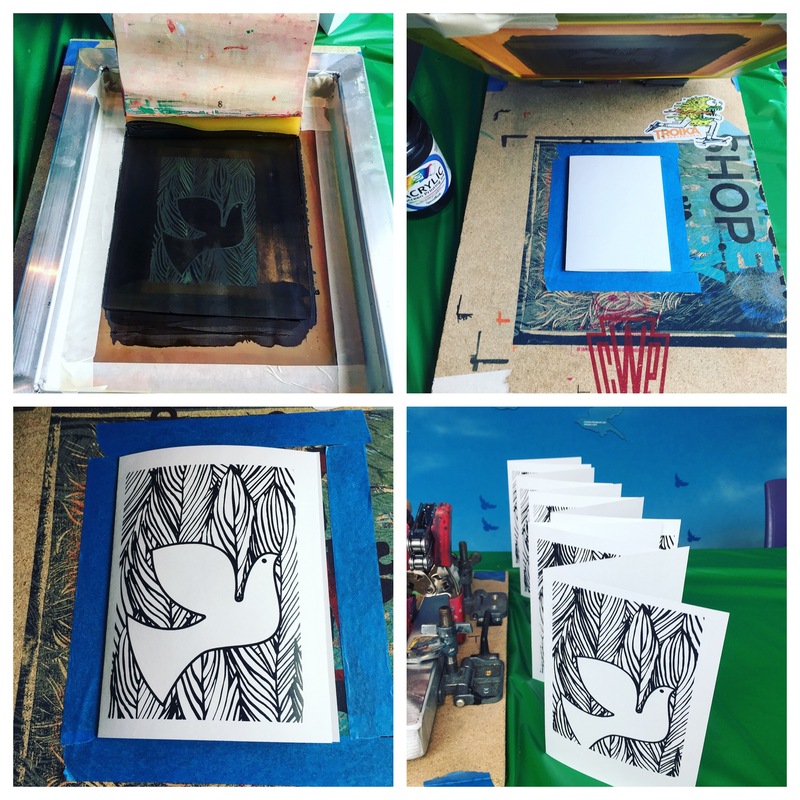 As a part of our Maker Challenge Month, Allison did a silkscreen print demo at the The National Aviary onto blank greeting cards of our new Peace Dove design that also double as a coloring page that both the little ones and grown ups can color, (or leave as is in striking black & white) to frame or to send to friends and family. 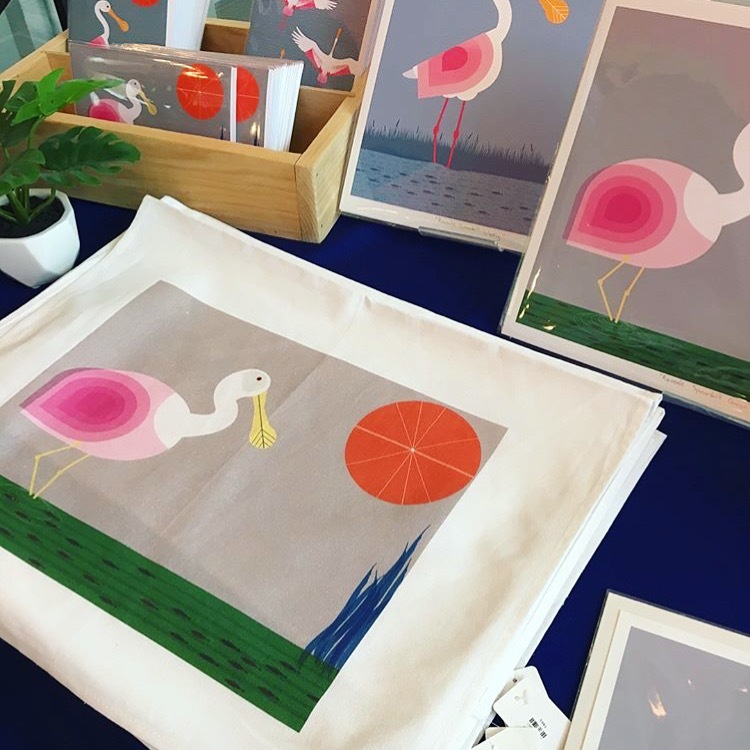 If you are heading to The National Aviary in March, definitely drop by the front entrance gift shop and check out our Roseate Spoonbill exclusive pieces, as well as the items from some of the previous artists in The Maker Challenge!